Cosmetic bonding refers to restorations made from composite plastic material, and is used similarly to porcelain veneers and onlays. The cosmetic bonding requires no outside lab procedure, done completely in our office at the time of your visit as it is built directly onto the tooth structure. Bonding is durable, tissue compatible, kind to the opposing teeth, and stain resistant. We are able to make absolutely the thinnest restoration possible preserving the greatest amount of natural tooth structure. Exquisite natural esthetics can easily be achieved, as well as the light transmitting qualities found in natural teeth. Cosmetic bonding is most often used to close spaces, replace worn enamel, repair broken or chipped teeth, re-shape crooked or misaligned teeth, and to cover permanently stained or discolored teeth. Composite bonding is also used to fill cavities and to replace existing harmful mercury silver fillings. One of the most common esthetic dental concerns is also one of the easiest and uncomplicated treatments available. A chip in a front tooth, worn uneven edge, shallow pits or grooves in the tooth enamel are all minor issues, and simply resolved with esthetic tooth contouring. Using a polishing instrument, Dr. Field is able to remove small amounts of tooth enamel leading to improved shape and aesthetics of your teeth. This quick and bother free procedure can make a big difference in your smile immediately. Because it is relatively inexpensive and noninvasive, it is a good place to start to get your smile back. Minor bite problems can also be resolved with contouring and reshaping. An ideal candidate for esthetic tooth contouring would have slight imperfections in their teeth such as small chips, minor unevenness, minor overlaps, shallowly pitted surfaces, or worn biting areas in their teeth. Other indications for the procedure are one or more teeth out of proportion in size to the rest of the set, such as large, pointy canine teeth. Reshaping can only occur on healthy teeth, so to check for any contra-indications digital x-rays are often taken before the procedure is done. Veneers are ultra-thin custom made shells of ceramic (porcelain) or a composite resin material, which are bonded to the front of your teeth. This procedure requires little or no anesthesia and can be the ideal choice for improving the appearance of your teeth. Veneers are a viable option for correcting stained, chipped, decayed or crooked teeth, or to mask discolorations, and to ultimately brighten your smile. Dr. Field has always been on the forefront of new innovations in dentistry. Teamed with the top ceramists in the country, his practice offers the most advanced dental restorations in the world today. The no prep veneer allows our team to create incredibly thin veneers that require absolutely no tooth structure removal. Unlike a similar product called Lumineers, Dr. Field’s no prep veneer is built with artistic layers and colors that mimic a real tooth, as opposed to the single colored Lumineers. The resulting restoration is very natural and lifelike and incredibly strong. Many patients are uneasy and apprehensive about enamel contouring, especially when the teeth are healthy. Non prep veneers offer the conservatism of composite bonding while delivering the durability and beauty of porcelain veneers. The very thin contact lens-like veneer bonds directly to healthy tooth enamel with no tooth reduction and in many cases no anesthesia. The type of veneer is especially useful in cases where the teeth are too small due to advancing wear or genetics. Porcelain veneers are the flagship procedure in cosmetic and restorative dentistry. Porcelain veneers are thin shells of porcelain that are bonded to teeth. Why should people choose porcelain veneers? Unlike veneers made out of other materials, porcelain ones are able to reflect light the same way that a person’s natural tooth enamel does. Furthermore, porcelain is able to resist stains, which is important for all of the coffee and wine lovers out there. This, on top of the fact our dentists will craft each veneer to suit each patient, means that it will be nearly impossible for people no notice. When people look at a person who has veneers, all they will see are natural-looking, beautiful teeth. Veneers do not only work to improve the color of teeth, but their shape as well. Veneers can be made to cover chipped or cracked teeth, as well as reshape them and hide unsightly, worn-down enamel. People who have unsightly gaps between their teeth can also look into veneers to help correct this problem while simultaneously providing them with a brighter smile. 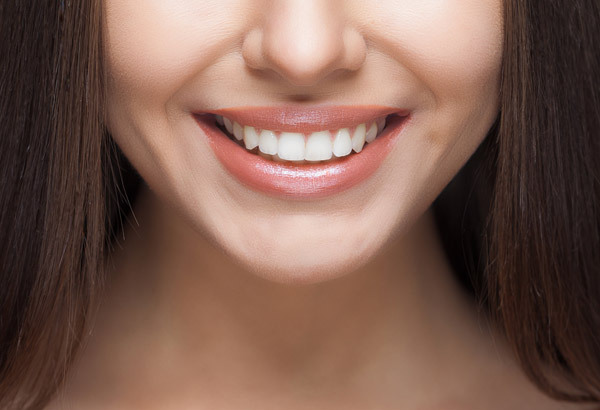 Porcelain veneers can be very thin (as thin as a contact lens), allowing for minimal or no tooth reduction, and in some cases requires no anesthesia. Preservation of the strong enamel tooth structure provides for a longer-lasting restoration and is minimally invasive. Porcelain veneers or onlays are also used on back teeth, and is our preferred conservative method to restore broken molar teeth or to replace large mercury silver fillings. Our porcelain veneers and onlays appear as a natural tooth, in other words totally invisible. Additionally, veneers do not require a great deal of special care. People who have them simply need to brush and floss as they normally do and visit a dentist for regular cleanings to help their veneers continue to look gorgeous. People can have the teeth they’ve always dreamed of in just a few quick trips to the dental office. Those who are interested should make an appointment with our dentists to find out more about veneers. Dental Crowns – commonly referred to as caps, are traditionally used in restorative dentistry today. Dental crowns protect and restore teeth. In this way, they prevent further tooth damage and maintain a healthy, pleasing smile. Because the enamel has to be totally removed from the natural tooth for a crown or “cap” to be placed, the stronger and more conservative onlay or porcelain veneer restoration is generally the treatment of choice whenever possible. However, when teeth are badly broken, extensively decayed, or if existing caps need to be replaced, an all ceramic crown is the treatment of choice. Dr. Field has extensive training and experience in crown placement and has successfully placed hundreds of these restorations. Our office has never used mercury silver fillings since its founding. Dr. Field believes that tooth colored composite fillings are a stronger and healthier choice for our patients. The tooth colored material made from plastic resin is very durable, tissue compatible, kind to the opposing teeth, and stain resistant. Tooth colored fillings allow us to preserve the greatest amount of natural tooth enamel, and perhaps more importantly, they are made from inert non-toxic ingredients.